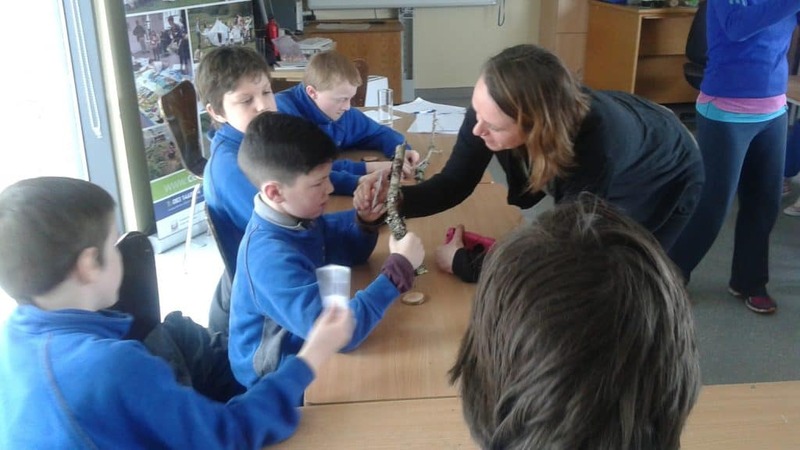 CEF ran 2 workshops on Friday at Blackrock Castle Observatory with children from the nearby Scoil Ursula, facilitated by Jessica Mason. The children explored and learnt about the many benefits that trees provide, using microscopes to examine tree rings and creatively making decorative tree “cookies”. Afterwards there was a tree planting event at the school, with trees purchased by VM Ware and volunteers from the company assisting with the planting. These trees are the important initial foundation to creating a wildlife hedgerow habitat. 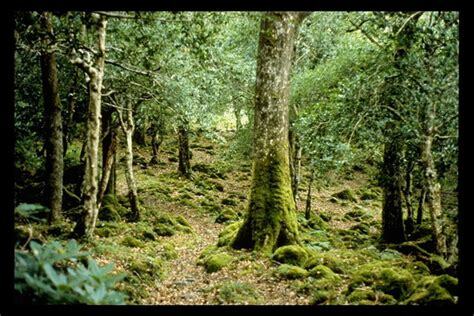 ESB Tree Week, organised by the Tree Council of Ireland since 1985 is a week long programme of events to celebrate trees. The event is sponsored by the ESB in association with Coillte. 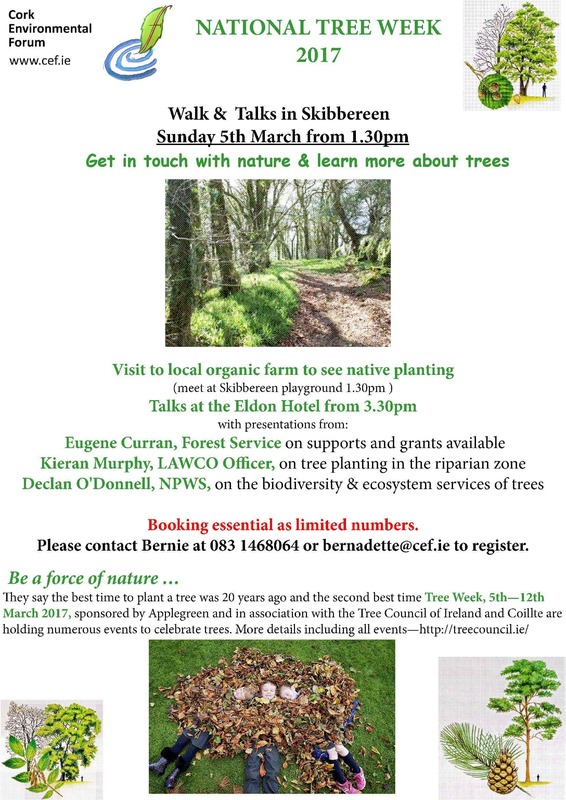 ESB Tree Week 2016 runs from Sunday March 6th until Sunday March 13th. CEF is running a number of workshops at Blackrock Castle with children from Scoil Ursula, followed by a Tree Planting at the school supported by VM Ware. We promote the planting of trees, highlight the environmental benefits of trees – a tree forms an oasis of shade, provides wildlife habitat, and improves air quality. The importance of taking time to enjoy your local woods and trees has the added health benefit of taking exercise in a natural environment. There are lots of events happening all around Cork so please check out the Tree Council Website for the full list of events. Please see following 2 great events in Macroom on Sunday and Tuesday led by Ted Cook. Lovely afternoon at Future Orchard Trust in Glanmire. Tom O’Byrne, Ecologist, introcduced us to the fascinating project of clay sand martin and house martin nests which have ben developed in conjunction with artist, Martha Cashman. Martha showing Conor Kelleher the house martin nests. The sandmatin tube access shape and nest can be inserted into walls of buildings. Conor Kelleher gave an expansive and as always animated insight to the 9 bat species in Ireland, including the interrelationship with Trees. Johanna, Jenny & Rebecca examining the different species of bats! A long eared brown bat. I would be most grateful if you might vote for ‘King OAK’ – Ireland’s nomination in the European Tree of the Year 2013 Contest. We are in third place at present but need many, many more votes if we are to win. European Tree of the Year 2013 Contest is running until 28th February. 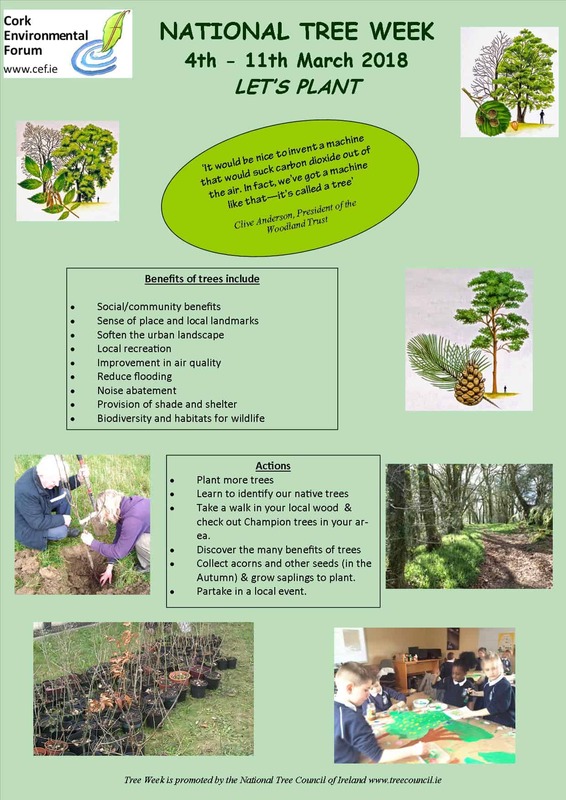 In these difficult times, the Tree Council and Balfour Beatty CLG recognise the challenge for groups and organisations who want to do something positive in their communities and the aim of this funding scheme is to assist local groups in the achievement of well-planned tree planting initiatives. The application process is competitive and projects will be judged on their ability to fulfil key criteria such as providing long term benefits in locations with little greenery or tree cover, applying good practice in the selection, planting and management of trees, active engagement of the local community in the project and having in place a plan for ensuring the proper care and maintenance of the trees into the future. Successful applicants will receive up to 75% towards their project costs subject to a maximum grant of €500 per project. The grants scheme is aimed at groups who are community focussed and which foster participation across the generations. Community tree projects can include planting individual trees on streets and public green spaces, establishment of small, native woodlands on publicly accessible land for amenity and biodiversity, commemorative tree planting initiatives or perhaps planting a collection of fruit trees as community orchards. The sites available for such projects are often unused or neglected areas that can be transformed by the planting of trees. The most effective community tree projects are those undertaken by local people with an understanding of local needs and attitudes. By assisting local groups to develop tree projects within their community, the idea is to create a sense of shared ownership of the trees and foster pride amongst the community in ‘their’ trees. Tree projects that originate from within a community will invariably have a greater chance of success and endurance than those that are put in place by an outside agency. Julie Maund, Corporate Responsibility Manager with Balfour Beatty CLG, said ‘We are delighted to sponsor this Community Tree Project Grants Programme as part of our Corporate Responsibility Programme. It is consistent with our commitment to improving the environment in communities across Ireland, with the involvement of local people’. If you have an idea for a tree planting project in your community, you may be able to access funding for your project through this new grants scheme. For application forms, and more information about how to apply, visit www.treecouncil.ie . The closing date for receipt of applications is January 20th 2013. Trees enhance the places where we live, learn, work, rest and play. They make neighbourhoods more attractive, healthy places to live and yield benefits such as cleaner air, flood control, noise abatement, enhancement of wildlife habitats, better physical and mental health, increased property values and a more desirable location for businesses and tourism. For example, a large tree can produce enough oxygen for up to four people each day. One hectare of trees generates enough oxygen each day for 43 people. It takes about 500 large trees to absorb the CO2 produced by a typical car driven 20,000km/year. Properly placed trees can reduce residential heating and energy costs by an estimated 20 to 50 percent. The presence of trees can boost economic activity in a neighbourhood and increases property and land values by up to 15%. Balfour Beatty CLG is a joint venture between Balfour Beatty Utility Solutions and CLG Developments Ltd, working with Bord Gais to install and maintain gas transmission and distribution networks across Ireland. Balfour Beatty CLG works at the heart of local communities in Ireland and around the world as part of the wider Balfour Beatty Group. Our team is dedicated to building long-term, collaborative relationships with the communities in which we work, and with other organisations and stakeholders. We believe that in addition to the contribution we make to the physical fabric of society we have a responsibility to support its social fabric too. We are committed to leaving a legacy in the communities that surround us, to encourage active citizen participation, as well as a proactive contribution from our own employees. 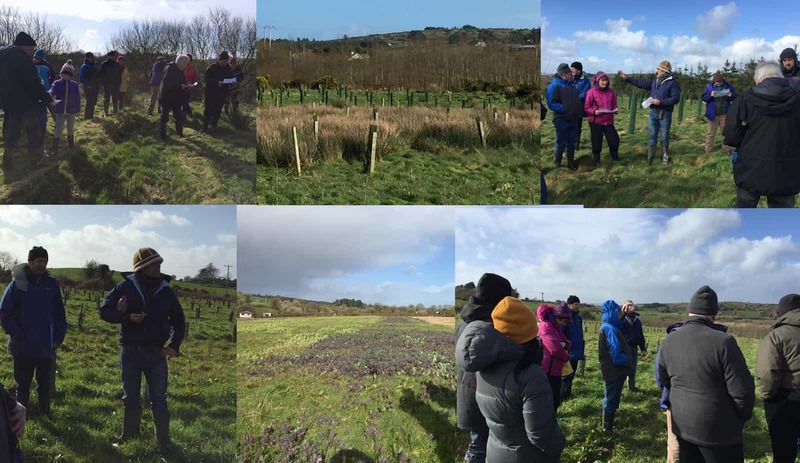 The Tree Council of Ireland is an umbrella body for organisations involved in tree planting, management and conservation. The main role of the Tree Councils is to promote the planting, care and enjoyment of trees and it does this through networking with its members and friends, the organisation of events, educational programmes and tree related activities, the publication of literature, the management of national tree records and through the provision of an information service to the public. Success with searching out acorns, a few hundred have been collected thus far. We are appealing for pots, preferably small 3 ” ones. If anyone has some to spare do please get in touch and we can arrange collection.Contact bernadette@cef.ie or 083 1468064. Thanks for your genrosity, this project is aiming to create a sustainable supply of oak saplings to plant around the county each March during National Tree Week. Please remember if collecting acorns that the preference is to collect from native sessile oak. Also do leave plenty for the woods to regenerate and for wildlife such as squirrels! Thanks to Caragh & Peter Thompson, Griffins Garden Centre and Irish Natural Forestry Foundation (INFF) for their kind donation of plant pots for the acorns collected. This hasn’t been a great year for fruit and that appears to include the acorn. Despite foraging in quite a few areas by interested individuals searches have been unsuccessful in a numbr of key woodlands. Its a start and has also inspired some individuals to do a bit more growing from seed. Thanks to everyone who got in touch in response to this project and to searching in woodland such as Fota, Muckross and INFF but unfortunately like many other fruit this year the acorns were in very short supply. I managed to get over 200 at the woods in Glengarriff and a few others found some also – so whilst its not the 1000+ we had hoped for it is a start and it has also encouraged a few people to start collecting and growing themsleves. Following are some of the acorns collected from a sessile oak in Glengarriff Nature Reserve, a few are already sprouting. Planted in the pots kindly donated by Caragh and Peter Thompson, Griffins Garden Centre and INFF, they are ready to be dispatched to St. Patrick’s, Upton to be looked after by the horticulture project there until ready for transplanting in 2 -3 yrs. Can you help to collect acorns this Autumn? Cork Environmental Forum always participates in National Tree Week and this year we were lucky to get a donation of 1000 + saplings, however, a suggestion through our Management committee was why not try to develop a sustainable on-going supply of saplings to distribute each year during tree week. It will take 2/3 years for the first lot of saplings to be ready to transplant but we thought time to start, so 1001 Acorns was suggested. The oak being one of Ireland’s most loved and iconic tree was chosen as the seeds (the acorns) are easy to collect and relatively easy to grow. Much of our ancient forests have disappeared and we have a low level of native broadleaf tree coverage generally. In addition trees such as the oaks provide a habitat for a broad range of species. Whilst the oak may not be the most suitable for all areas of the city there are some nice species of oak there and room for many more in some places. St. Patrick’s Upton have agreed to partner with us in relation to the raising of the saplings, they will provide space to store the potted acorns, to maintain the saplings and in some instances will help with planting through their horticultural project. CEF will be responsible for liaising with groups and checking if groups want to donate or grow themselves. We can also provide plant pots and when ready co-ordination of the distribution of the saplings. All groups that collect and donate acorns would get saplings, once ready, in return. It would also be good to select a particular project each year that might benefit from a substantial number of saplings. As this Thursday is National Tree Day I wondered if any of you have plans for a woodland walk? If so, if you come across a good stand of oaks perhaps you could check if they have acorns and if they are ready or not to fall. 1. Collect acorns in Autumn (but be sure not to take them all). Choose ones that are free of worms, holes, and fungus. 2. Put the acorns in a bucket of water for a couple minutes. Discard any acorns that float. Good to plant in 3 inch pots (unfortunatley probably best to use the plastic ones, or old cartons, so they will last 2 -3 years). “Some good trees I have noticed were in Fota on the road into the golf club and all around the walk at Doneraile Park. Mucross is also a possibility, especially because many oaks there are truly native. It is a bit of pot luck and being in the right place at the right time. But anywhere there is a good stand of oaks could see a good tree or two. Be sure to plant them straight away, acorns do not keep well.” Padraig Coakley. Let me know if your group or any of your projects you know would like to get involved in collecting the acorns and supporting this initiative.